Rubrics help students recognize learning goals and guide them in reaching for those goals. 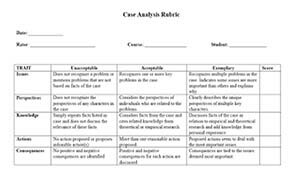 Particularly useful in student-directed teaching approaches, like inquiry-based learning, rubrics can be used to assess content mastery, skill development, or even attitude toward a topic. Developing a rubric involves clearly identifying and articulating specific outcomes of learning and structuring those criteria in an easy-to-use format that serves as a reference tool in guiding learning and an assessment tool for evaluating success. In inquiry-based instruction, faculty can work collaboratively with students to develop the rubric, or integrate the rubric by distributing it as part of the assignment description and/or for students to use in peer- or self-assessment. Reflect on Expectations:1,2,3 Why did you create the assignment? Define what you hope students will learn and how you expect students to show mastery. Identify Distinct Criteria: List specific details or dimensions of the assignment you will target in your assessment. Look for categories or groups and label them. Determine Levels: Set your range and scoring scales, usually between 3 and 6 levels. Your levels can be qualitative (descriptive only) or quantitative (point values). Some quantitative rubrics use a range of numbers for each level; others use a set value for each level. If you want to build a rubric yourself, a Rubric Template or an Online Rubric Generator will be helpful! Learning at University of Illinois, Springfield. Available online. students ... Assessment Office, University of Hawai’i, Manoa. Available online.